In this blog, i will discuss the changes in Material master data. Structurally material master is same and the old transaction (mm01, mm02, mm03) still exists in S/4HANA world. However, there are some fields removed, new material type added and length of material has been changed but beyond that, there is not much changed from a functional perspective. 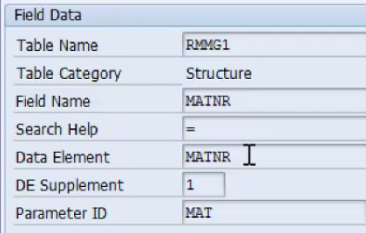 The first change is material master field length earlier it was 18 character in ECC now it has changed to 40 characters in S/4HANA. If you go to F1 help and click on technical data and double click on data element. IN ECC the length of the material is 18 character. However, it is switched off by default. The length of the material is 40 character meaning technically material length take on to 40 characters but by default, it is not set to 40 characters. Unless you check this on SAP will not use entire 40 characters in all external interface communication. You can very well create a material with 40 characters. But when you use interface to communicate like sales order, purchase order using IDOC or any other mechanism. SAP is still using old 18-character material length. That is because BAPI and all the system that is built and place are basically with 18 characters. For a functional consultant, the definition of material is 40 character but when it comes to interface, the external system does not know what is the definition of material. So you have to check the Flag for the Extended material number so that SAP is starting to use the extended field for communication to external system when it comes to material master. You can restrict the length of the material master. You can use transaction OMSL where you specify the format of material master. The second change in material master the field Foreign trade data is no longer relevant in S/4 Hana. It is all part of GTS now. If you like please give me your valuable feedback. The SAP document does mention about Material Ledger being mandatory for Material Valuation. I guess you may want to add that bit too. Material description (MAKT-MAKTX) is only 40 symbols. Is SAP going to increase length of this field? Sometimes it is a nightmare to maintain descriptions. And, on the other hand, long texts are very inconvenient for maintenance and it is very difficult to work with them in ECC 6.0. Also all current search helps are designed to work with material descriptions (not long texts). Also all documents are displayed by default material description. Are there any changes in the current data model for material planned? Because current work with materials is extremely complicated. Just one example (but there are a lot of other use cases), user1 created material with basic data 1&2 views. Then user2 see this material in Z-report (unfortunately, there are no adequate material reports in standard ECC 6.0 functionality) and user2 is trying to add characteristics for this material. ALL users are confused that they have to go to transaction “Create material” and maintain Classification. And such confusion relates to almost all logic in material master maintenance. It would be great if SAP will design something easier and more user friendly in S/4HANA Simple logistic. I think it should be possible. If you use MDG (even on ECC) with HANA it is very simple to have PO long text as the Search Criteria. PO long text would have filter value BEST, Basic Long text would have GRUN etc. Thus a user would know before adding (classification data in your example) which material to choose. SAP MDG is thus really helpful when Master data maintenance is concerned. I try to update the location-product in /sapapo/mat1, but none of the fileds are editable ..
How can I change the product in planning version 000 ?Do you have any suggestions ? thanks..